According to the Centers for Disease Control, the recent number of adults diagnosed with sinusitis in the United States is about 28.5 million. That’s roughly, 12.1% of the adult population, and at least some of these cases can be attributed to allergies alone. Seasonal allergies affect many of us in different ways, especially in the area of the sinuses and the sinus passages. Pollen from trees, plants, and grasses often causes stuffy noses, runny eyes and achy heads. Sometimes, however this can lead to a more serious condition known as, “sinusitis”, or swelling and inflammation of the sinuses, (the air cavities surrounding the nasal passages). This may prevent normal drainage of the mucus the body creates to protect the lungs from foreign invaders such as dust and debris. As mucus collects in the nasal passages bacteria begins to grow. This may cause infection of the surrounding tissue that can spread through the sinus cavities. 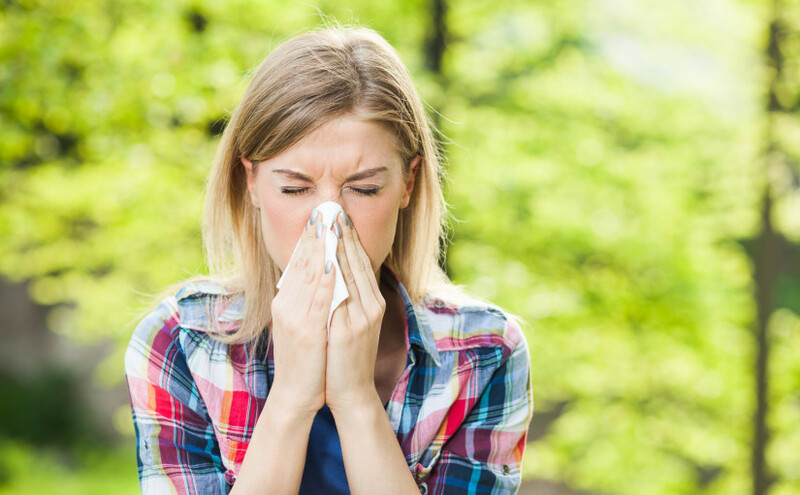 While allergy symptoms may appear similar to that of a sinus infection, a physician must diagnose this through a physical examination, an x-ray of the sinuses, or a specific test for bacteria of nasal discharge. Symptoms of sinus infection may range from discharge that is thick and yellow, or green in color that runs from the nose, or down the back of the throat. The nasal passages will generally also be obstructed, causing congestion. There may be swelling in the face, around the nose, cheeks, eyes, or forehead, and it may be more difficult to taste or smell. There are two types of sinusitis, which include, acute sinusitis, and chronic sinusitis. (Sinusitis can be caused by infection or allergy irritation). Acute sinusitis: This is the temporary inflammation of the sinuses where mucous membranes in the nose, sinuses, or throat become inflamed due to allergies. The swelling caused by allergies blocks mucus from draining, causing pressure to build in the sinus area. Chronic sinusitis: If symptoms persist for more than 12 weeks, or if persons experience more than three sinus infections in one year, then sinusitis is considered chronic. Over 50 percent of people with moderate to severe asthma have chronic sinusitis. A sinus infection may be treated in a variety of ways depending upon the severity of the infection. This is the initial first step that is needed to treat a sinus infection. Without proper drainage, the bacterial infection will remain in the nasal cavity causing further inflammation and damage to the tissues. A physician may flush sinus passages or advise the patient to inhale steam, or sleep with a vaporizer to loosen phlegm. Sprays containing steroids can be used to decrease inflammation of the nasal lining. Physicians prescribe a course of antibiotics to fight infection in the sinus cavities. These may be prescribed for chronic sinusitis, but are powerful with significant side effects. Generally they are only prescribed when other medications have failed. Sprays are helpful for many people to decrease inflammation, but can often lead to damage of the nasal lining. Some patients with chronic sinusitis that have not responded to antibiotics or other medications may be candidates for functional endoscopic sinus surgery (FESS), or a “balloon sinuplasty” to help clear sinus pathways and allow for normal drainage of mucous. Sometimes allergies or hay fever can lead to sinus pressure and headaches in the front of the head or around the eyes. A physician must diagnose true sinus headaches since they may also be confused with migraine pain because of their location. Sinus pressure caused by blocked or inflamed sinus passages may press on the nerves surrounding the ocular area and head causing severe headaches for some allergy sufferers. If an infection occurs due to bacteria from mucus build up, the sinus passages will remain swollen and inflamed causing pressure and possible headache pain to persist. It is important to note that many people who “self diagnose” their headache as a sinus headache really suffer from migraine pain. (Research finds there is a link between migraines and allergies). There are four pairs of paranasal sinuses contained in the skull that help the voice resonate and make the skull lighter. Within this area, severe headache pain may occur in connection with allergies, sinusitis and sinus infection. Physicians use specific criteria to diagnose true sinusitis (rhinosinusitis) headaches. A headache must be present in the front of the head with additional pain in the ears, face, or teeth. There must also be clinical evidence of either acute or chronic rhinosinusitis. (A nasal endoscopy, CT, or MRI could provide this, as well as some type of nasal or sinus culture performed by a physician). A headache must be present at the same time as rhinosinusitis symptoms. Within a period of seven days of successful treatment, (or reduced symptoms) of acute or chronic rhinosinusitus, the headache and/or facial pain disappears. This site is not designed to and does not provide medical advice, professional diagnosis, opinion, treatment or services to you or to any other individual.